Moridi (Tehran, Iran) on 12 December 2013 in Art & Design and Portfolio. Homa, is a legendary bird especially within the Iranian mythology. It is said to never come to rest, living its entire life flying invisibly high above the earth, and never alighting on the ground (in some legends it is said to have no legs). The ruins of Persepolis, the capital of the Achaemenid two stone statue of the Homa has been found. 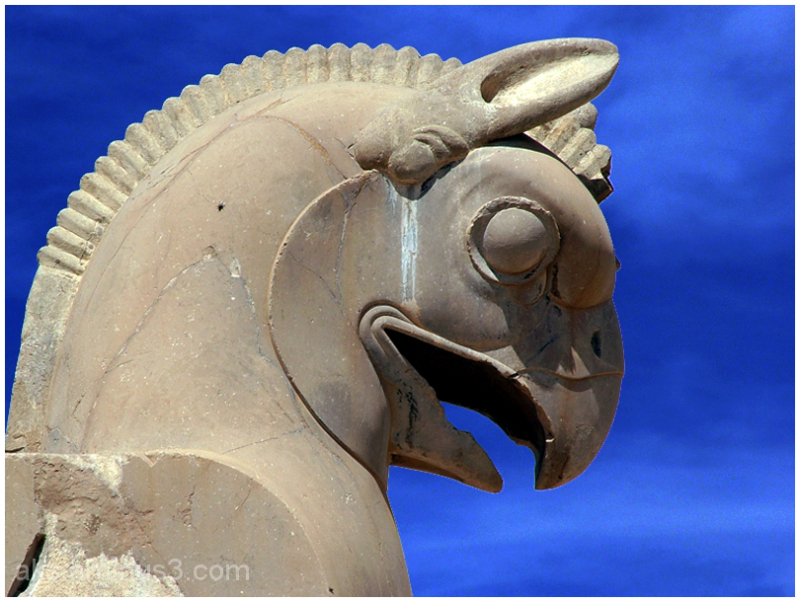 The role of bird carving and some of the pillars of Persepolis also suggests. This suggests that in ancient Iran Homa bird was bliss. @maedeh ashrafi: Thanks for your comment. @omid: Thanks for your comment. @mahdi: Thanks for your comment. @Tomek: Thanks for your comment. @grouser: Thanks for your comment. @helys: Thanks for your comment. @Jules: Thanks for your comment. @Adela Fonts: Thanks for your comment. @Universe: Thanks for your comment. @Parastoo: Thanks for your comment. Splendide cette sculpture dans ce ciel bleu, magnifique shot. @Tede: Thanks for your comment. Excellent against this dramatic blue! @my-ky: Thanks for your comment. @Ruthiebear: Thanks for your comment. @سيد حسن كاوشي: Thanks for your comment. @Kate: Thanks for your comment. @mohammad: Thanks for your comment. Excellent framing and contrasting blue sky. @Francisco Romero: Thanks for your comment. @rem_la: Thanks for your comment. @thami: Thanks for your comment. @Lena: Thanks for your comment. A superb image of this mythological bird. @Steve Rice: Thanks for your comment. A gorgeous image of this wonderful bird. Gorgeous color and detail. I love how it stands out against the blue sky! @Elaine Hancock: Thanks for your comment. Quelle statue avec la bouche ouverte sueprbe compo. @Nicou: Thanks for your comment. Thanks for telling the story and sharing the picture, love this beautiful blue sky behind the stone statue. @Diana: Thanks for your comment. @SalSa: Thanks for your comment. @Ms. khalatbari: Thanks for your comment. @Akbar&Armaghan: Thanks for your comment. @Shaahin Bahremand: Thanks for your comment. Excellent détail , bien cadré et qui jouit d'un très bel éclairage! @Monik: Thanks for your comment. @claudie: Thanks for your comment. Majestic sculpture and interesting info. @Julie L. Brown: Thanks for your comment. @theven: Thanks for your comment. Fantastique oiseau de légende ! @ceteceva: Thanks for your comment. @AMH: Thanks for your comment. Belle composition de cette statue avec une belle lumière ! merci pour les explications ! Beautiful composition of this statue with beautiful light! thank you for the explanation! @michel creze: Thanks for your comment. The statue has a marvelous design. The account was very interesting. @Don: Thanks for your comment. @Henri: Thanks for your comment. An interesting comment and a great photo. @Jean-Louis Guianvarc'h: Thanks for your comment. Very interesting and beautiful ancient sculpture. Well framed and with a good light. @Longroute: Thanks for your comment. Nice sculpture, and nice blue sky. @Florence: Thanks for your comment. @pixim: Thanks for your comment. Magnifique sous ce ciel bleu! @Mamyni: Thanks for your comment. @john4jack: Thanks for your comment. I like the simplicity and clarity of this image. Thanks for the explanation. @Anita: Thanks for your comment. Nice shot. I love the subject. Simple and strong. @Rebecca: Thanks for your comment. I like the colors and shapes of the sculpture along with the mottled blue sky. @Harry: Thanks for your comment. Thanks for the story. Nice bliss shot. @Hiro: Thanks for your comment. lovely color and interesting legend! @Abena: Thanks for your comment. @Martine Libouton: Thanks for your comment. @AminAshkan: Thanks for your comment. @RBL: Thanks for your comment. Superbe sculpture, parfaitement bien mise en valeur ! @Marie-France: Thanks for your comment. That is very nice. It looks great with that blue sky behind. @Michael Rawluk: Thanks for your comment. Nice sculpture, great capture on the azur sky. @Evelyne Dubos: Thanks for your comment. @Melocoton: Thanks for your comment. @Lewis: Thanks for your comment. I hope he does not bite. @B. Thomas: Thanks for your comment. Nice with good information . @farNaaz: Thanks for your comment. @Jackie: Thanks for your comment. @Shiva: Thanks for your comment. Fascinating narrative accompanying this great close up. @Sharon Pleasants: Thanks for your comment.